Stephen Breyer, 2009. Photograph Credit: Chicago Tribune. Much has been made recently about Obama and his putative pragmatism - where by the latter I mean not simply opportunism but a philosophical position with political implications. * I think that that characterization of Obama is strained, at best. As an indication of why, I suggest that you watch the short clip included in this report. The clip is part of an interview that Justice Breyer of the U.S. Supreme Court gave this morning with Chris Wallace at FOX News. 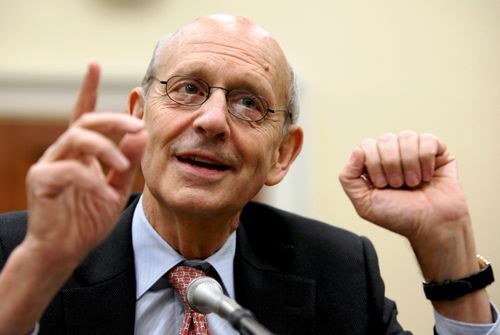 Breyer is himself on tour, peddling a new book. ** There are two issues on which Breyer seems especially astute. First, is his appreciation of the visual aspects of political ritual, in this case the annual State of the Union address. But, second and more importantly, Breyer who himself claims to be a pragmatist, stresses through out the segment the importance of diversity and disagreement. He, unlike Obama, is not all about consensus and compromise. So, while conservatives on the court took umbrage when - in a rare moment of actual progressive chutzpah (defined as audacity) - Obama criticized their Citizens United decision in last year's address, Breyer seems to welcome such disagreement as healthy. He is quite clear that while the court issues opinions in support of their decisions, the American population will - quite legitimately - challenge those opinions. So he is concerned less with forging consensus than with the basic issue of how disagreement can be structured in such a way that legislation and judicial decisions can be accepted and, hence, be effective. In raising that issue, and in recognizing the importance of robust disagreement, he makes both his colleagues on the court and Chris Wallace, the FOX interviewer - with their notion that the court is somehow due automatic deference - appear especially feeble. * James Kloppenberg. 2010. Reading Obama ~ Dreams, Hope & the American Political Tradition. Princeton University Press. ** Stephen Breyer. 2010. Making Our Democracy Work: A Judge's View. Knopf. I can hear what you're saying about Obama -- both here and in earlier posts. But couldn't it be said that his positions are more a result of the lack of a principled position on the other side? As a Canadian perhaps inordinately interested in the goings-on down your way, the rhetoric of the right just doesn't seem to amount to anything one could negotiate with. It is simply intransigent. I agree that the Republicans have no program or agenda other than oppose Obama. But they have been running to the extreme right for decades and everyone knows it. So Obama is simply playing their game when he tries to be accommodating and centrist as they continually push debate and policy rightward. I think Krugman gets it pretty much just right. A leader (which Obama claims to be but is not) ought to be challenging the agenda setting and negativism of the right. Obama rarely does that and even more rarely does so with any conviction. And Obama capitulated to the intransigence while he still had nominal majorities in both houses of Congress. When one negotiates it is necessary to play hardball. Obama? He has not done that a single time. Generally he gives the game away before the policy debate begins (hence, for instance, the public option in health care was off the table before the reforms even cam up for discussion). The problem, as I've ranted before, is that he is a center-right politician in progressive clothing.